After our escape we jumped onto a bus to Sirok for a days walking along the National Blue Trail to Kekesteto . The National Blue TrailÂ is the oldest long distance footpath in Europe and forms part of the E4 and Kekesteto is the highest point in Hungary. The National Blue TrailÂ was well marked with a blue flash and we soon found our way. When we finally arrived in Kekesteto it was getting dark. After realising there was no where to stay we carried on walking down the ski slope to Matrahaza. Still no where to stay, by this time I thought we may end up sleeping in a bus shelter and funnily enough we tried getting a room at the sanatorium thinking it was a hotel ! Then thanks to the “Around Me app ” we discovered that a mile down the road was the 5 star Wellness hotel Ozon. This entry was posted in Budapest, E4, Hungary, Travel, walking on October 3, 2013 by Sally. Sunday 29th of September we took a trip on the hydrofoil up the RiverÂ Danube taking in the famous Danube bend ….. this was their last trip of the season ! It was a beautiful sunny relaxing day. After a lovely coffee while basking in the sun we took a walk up castle hill to look round the Basilica which is the largest church in Hungary. Then after a nice long lunch it was time for the return boat trip. 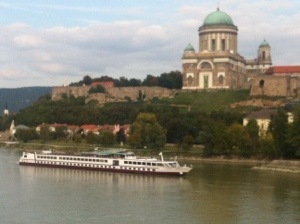 This entry was posted in Budapest, Personal, Travel on October 2, 2013 by Sally. I am sat here at Luton airport thinking how amazing it is …. This entry was posted in Budapest on September 28, 2013 by Sally.